Some photographers have an extended influence far beyond their public notoriety. Minor White epitomises these individuals. His work in analysing and teaching photography created a whole host of ‘followers’ and in some cases ‘acolytes’ and his writing still inspires today, but a lot of people don’t know his photography (or may be put off by his proclivities) which is a real shame. Hopefully this short biography will help as an introducton. 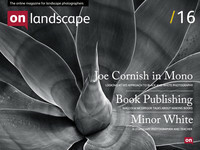 For extensive information about Minor White, I strongly recommend “The Eye That Shapes” which studies his work and teachings in some detail and includes a great sampling from his portfolios (see the book review in this issue). Minor Was born in 1908 to a book keeper and a dressmaker and received his first camera from his grandfather at the age of 8. Over the next few years his parents had various separations until they separated when he was 21. At 16, Minor inheritied a carbon arc projector and a whole load of historical travel slides.